Ultraframe’s Livinroof combines the best features of glass and solid conservatory roofs to deliver a system that’s built for comfortable living. Suitable as a replacement system – but also effective when used as part of a new-build project – the Livinroof will create a space that’s brighter, warmer, safer and which can be enjoyed year-round. Ultraframe’s Livinroof is truly unique. Its grey roof panels can be substituted by glass ones that can be placed anywhere and in any shape. Unique designs can be achieved with this clever conservatory roof system, which allows homeowners to focus where the light falls. Inside, the Livinroof creates a comfortable space for relaxing or entertaining. An insulated pelmet makes the conservatory or extension warm while allowing for the inclusion of speakers and lighting – instantly creating that all-important ‘real room’ feel. Your choices won’t be restricted when you choose Livinroof. This innovative system can achieve a pitch angle as low as 5° and works with any style or shape of conservatory roof – enabling you to meet the demands of your project. Another advantage of the Livinroof is that it’s pre-fabricated offsite; it doesn’t require any cutting on site and can be installed with minimal fuss and disruption. Contact us on 01329 233500 or send us a message to find out more. Explore the full benefits of the Livinroof system for your extension or conservatory project. Learn more about its thermally efficient design and strong performance across all other important criteria – including security, light transmission and fire safety. Please contact us with any questions or use our design tool to request a conservatory roof quote. Novaseal has 20 years experience of helping its customers find the right solutions for their conservatory projects. We’re an accredited company that belongs to Certass and has been accepted by the Which? Trusted Traders scheme – so you can buy from us with confidence, knowing your product is designed to perform and last. Transom bars will be used as part of your conservatory roof to improve its design. This feature is normally sited above a top-opening window. A range of options is available when using this enhancement as part of the Livinroof’s design. The transom bar supplied will include Kingspan insulation; a range of sizes will be available, including 90mm and 25mm. Externally, the bar exhibits an industrial matt effect and aluminium or composite panels can be used to complete the design. Explore just a few benefits of this innovative system to discover why it’s the perfect addition to any conservatory or extension project. Stay safe with this rigorously tested conservatory roof system. Livinroof has been tested as a complete structure and was certificated by Warrington fire following exhaustive tests in 2017. For our customers’ peace of mind, it is B-roof rated in line with EN 13501-5-2016. Its aluminium panelling has achieved an AA rating that meets BS476-3:2004 specifications. When replacing a conservatory roof, Livinroof is a perfect choice. It weighs 36kg/m², making it the lightest system available on the market – which means it normally meets the criteria set by a local authority’s planning department. 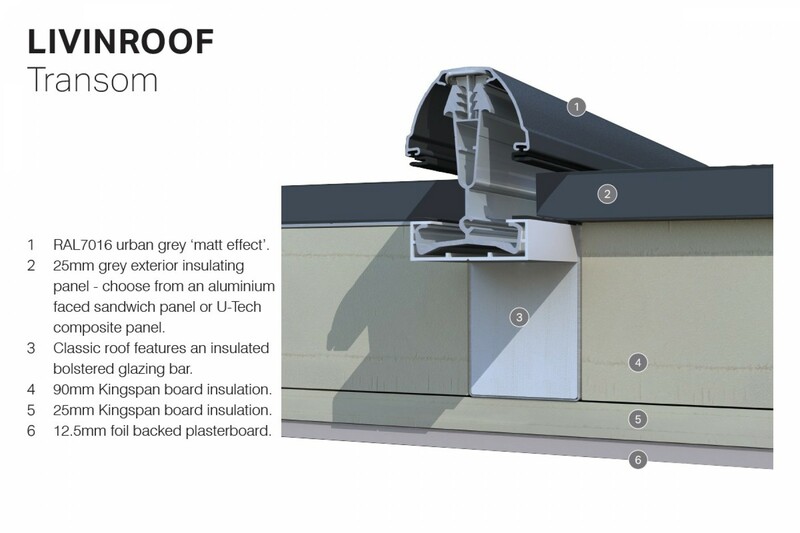 The lightweight construction of the Livinroof makes it easy to manipulate and install on-site. The Livinroof features various market-leading features that contribute to its strong thermal performance. A thermally insulated pelmet and broken rafters work with a system that includes no cold bridging – resulting in a conservatory roof that can produce a U-value as low as 0.16. Its performance is truly market leading. In addition to meeting all fire safety requirements, the Livinroof is built using NASA satellite data that anticipates wind and snow loading in the given postcode area. This means that your conservatory roof will be able to cope with harsh weather conditions without failing (it has even been tested to withstand wind speeds as high as 130mph). Enjoy a wider range of glazing options with this system. Add glazing wherever you want and, in any shape, to deliver a room that satisfies your design requirements fully. Performance glass can be added for enhanced capability. Ask about the glazing options available with this stunning conservatory roof design when contacting us. If you have a question about our products – or would like a quote – please call us on 01329 233500 or use our contact from to submit your enquiry. Use our design tool to generate prices for almost any of our products quickly, easily – and as many times as you like.